“I'm taken in mind to how, in the New Testament, in the profession of Jesus before his public ministry, the word "tecton" appears, which we translate as "carpenter," because then homes were mostly homes of wood. But, more than a "carpenter," it's an "artisan" who is able to make everything necessary for the construction of a house. So, in this sense, you are "colleagues" of Our Lord, as you've taken up what he did willingly, according to his own choice, before he announced to the world his great mission. The Lord has wished to show in this way the nobility of this work. In the Greek world, only intellectual work was considered worthy of a free man. Manual labor was left to the slaves. It's totally different in biblical religion. Here, the Creator -- who, in a beautiful image, made man with his own hands -- himself appears to give us the example of a man working with his hands and, in doing so, working with his mind and with his heart. Man imitates the Creator because this world given to us by his hand is an inhabitable world. This appears in the biblical story from the very start. But always, in a powerful way, in the fact that Jesus was "tecton," "artisan" -- "worker" -- appears the nobility and greatness of this work. 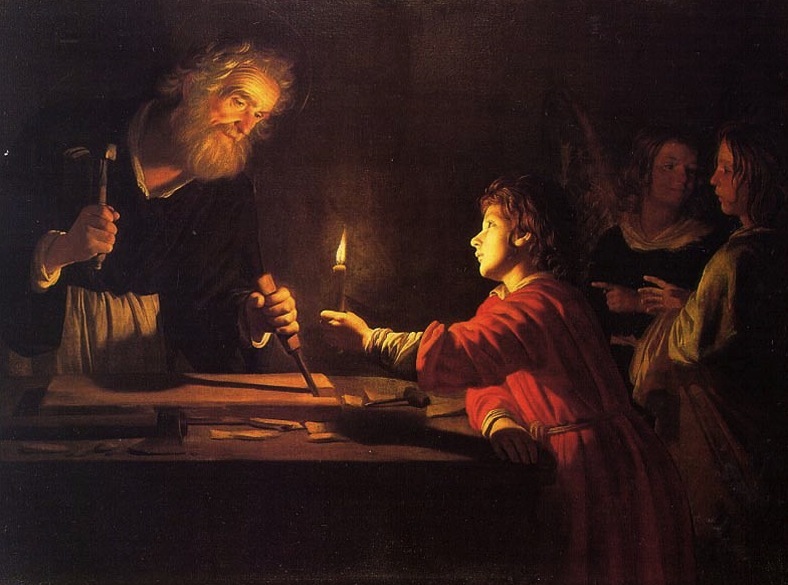 Observed in most of the Western world as the holiday honoring laborers, this May 1st was declared the feast of St Joseph the Worker by Pope Pius XII in 1955.